Explorer and Adventure Yachts- Two people were rescued this morning from sailboat, Lullaby. PORTSMOUTH, Va. - Two people were rescued this morning after their sailboat, Lullaby, struck a submerged object and quickly sank approximately 120 miles south of Bermuda. 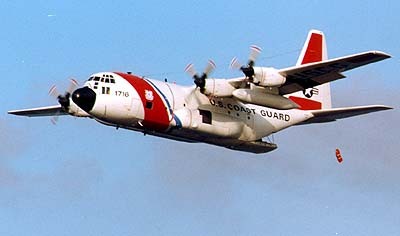 The vessel master used his vessel's VHF radio to contact the Coast Guard and also contacted the Rescue Coordination Center in Bermuda with an iridium satellite phone to let them know his location, the nature of the distress and the actions being taken to get off the vessel before it sank. The Coast Guard launched a C-130 search and rescue plane from Air Station Elizabeth City, N.C., and diverted the motor vessel Sol Do Brazil to rescue the two people from their life boat. Upon arriving on scene the C-130 was able to establish communications with the two adrift sailors via the vessel captain's hand held VHF radio and remained on scene and in contact with them until the Sol Do Brazil arrived and took them onboard. “He rescued himself by being that prepared,” said Coast Guard Lt. Cmdr. David Deuel, of the Coast Guard Command Center in Portsmouth, Va.
Deuel said, He had all of the right tools, how to use them and who to contact in emergency situation. Some of these tools include having a compass, an Emergency Position Indicating Radio Beacon (EPIRB), fire extinguishers, first aid kits, rescue flares designed to operate in a marine setting and futuristic gas-leak and carbon monoxide detectors that will alert boaters if levels become to high. The Coast Guard strongly encourages boaters to wear life vests, file a float plan with their local marina and their family members before going out on the water and know how to contact help in an emergency.